To me, appetizers are the ultimate comfort food. 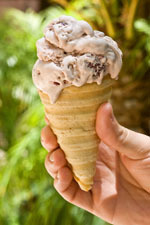 They’re a treat – party food, or something to share when my husband and I are out at a restaurant. With just a few bites through which to deliver something delicious and memorable – the flavors and textures of appetizers can be bolder, more intense, maybe even more decadent. Just a few amazing bites are all I’m after. When I began building these Smoked Sausage, Fig and Manchego Skewers in my mind, I could already taste the sweet and the salty, the smoky and the buttery. I could envision the grill marks on the sausage, the glistening honey-topped fresh fig rounds and the pretty little rosemary skewers anchoring each stack. Johnsonville Sausage, which has been making sausage since 1945, challenged me to create a fall comfort food dish and they’d love to give one lucky Panini Happy reader a $100 Visa gift card! Read on for my recipe and for details on how to enter to win the giveaway. When Johnsonville asked me to create a comfort dish, I found myself gravitating toward an appetizer. Not only would it be comfort food, it would also be fun to make the sausage kind of pretty – which isn’t always the easiest thing to do!I chose Johnsonville Smoked Split Rope Sausage to bring smoky flavor to this appetizer. I could have easily sautéed the sausage on the stove, but it was far quicker and easier to grill the slices on the panini press – it takes just two minutes to get them heated through with nice-looking grill marks. Unlike most other fully cooked sausages, Johnsonville uses absolutely no fillers for a juicy and firm texture and bite. 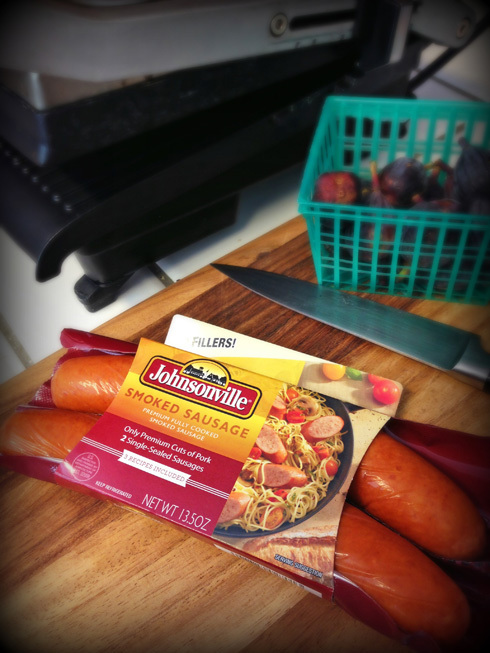 Johnsonville also only uses premium cuts of pork for even better overall flavor. And I appreciate that their portion control packaging comes with two individually-sealed sausages so it’s easy for me to use just one and save the other for another day. Speaking of saving for another day, by all means, when you try this recipe please hold onto the rosemary leaves that you remove to make the skewers. There are a myriad of uses for it – here are 30 suggestions from BuzzFeed! To enter: Please leave a comment on this post, telling us your go-to favorite appetizer to serve at a gathering. Lay half of the sausage slices on the panini press, close the lid, and grill the sausages until they are heated through with grill marks, about 2 minutes. Set the grilled sausages aside on a paper towel-lined plate and repeat for the remaining slices. Trim each rosemary sprig to 3-1/2 inches long. Holding the upper end of each sprig with one hand, use the other to run your fingers down the lower 1-1/2 inches of the sprig and remove the leaves. To assemble: Top each grilled sausage slice with a slice of Manchego and a slice of fig. Drizzle a little honey on top of each fig. Skewer each little stack with a sprig of rosemary and serve immediately. *Alternatively, you can heat the sausages on the stove: heat a tablespoon of olive oil in a large pan over medium-high heat and cook, stirring occasionally, until the sausage is lightly browned. It might be lowbrow, but in a pinch, it’s pigs in a blanket for us! I love toasting baguette slices and topping them with ricotta, cherry tomatoes, balsalmic vinegar and pine nuts! 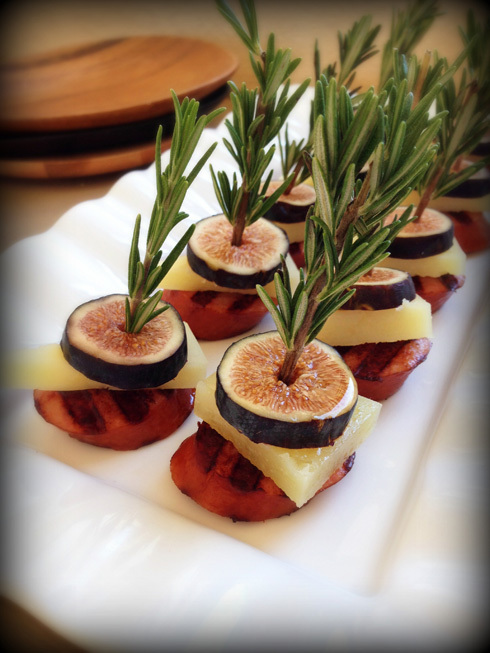 In keeping with the figs from your recipe….if it’s fig season, I love fresh figs (from my tree), goat cheese and prosciutto! I like to serve cheese and crackers at a gathering. I love scallops wrapped in bacon. Ooh, good one! I made pickled pearl onions for a little Christmas party a few years ago and they went fast. I’d forgotten. My go to favorite thing to serve at a gathering is baby quiche. My go to appetizer to serve is always shrimp. Everyone always eats it right up. I like Cilantro Mousse dip with crackers. Thank you! I love to serve mini spring rolls as an appetizer! It is healthy and delicious. I always have salsa and chips at every gathering! Love how you used fig here! I always have items on hand to make a quick antipasta platter. I always end up making skyline dip – cream cheese, skyline cincinnati style chili and cheaddar cheese -all baked in the oven. Another great addition to an appetizer party – these look so pretty, yet so easy to put together. Everyone loves a salty and sweet snack. I love taking cooked sausage and mixing it with cream cheese. Then I fill a mini muffin tin with biscuit dough or crescent rolls and put about a teaspoon or so of the sausage cream cheese mixture on top of it and bake until brown and bubbly! I don’t know the name of these, I call them the sausage cream cheese things, but they are always a hit! a cheese and/or veggie platter! boursin cheese with fig jam and triscuits is my easy, yet delicious go-to! Brie cheese, wrapped in puff pastry, baked, fig jam on top, after taken out of oven! My go to favorite appetizer is spinach dip! Can’t wait to try these! I never considered using the panini press to grill the sausage! My go to appetizer are caprese skewers! So quick, easy and delicious! My go-to is baked brie, but these little skewers are adorable and sound so delicious!! jalapeno popper dip or my mom always made ham and cheese crescent rollups and I love those. Ooh, those do look nice. I’m sorry to report I nave never eaten a fresh fig! I need to find some! I love serving sliced apples sprinkled with cinnamon sugar. Maybe it’s a childhood nostalgia thing, but people go wild over them. My go-to appetizer is a white bean dip with pita chips. Quick, healthy, and I always have the ingredients around! I love to pour Pic-a-peppa sauce over a block of cream cheese and serve it with crackers to cut off a dollop. Jalapenos stuffed with cream cheese and italian sausage, wrapped in bacon. I love these for the delicious ingredients and for how it looks up-scale but is really simple! My go-to might be chips and salsa or hummus and crackers for a casual gathering. Mini Quiche for a party atmosphere. buffalo chicken dip. It isn’t fancy but it sure is tasty! I like to serve a platter with fresh Veggies and a platter with Wisconsin cheese, such as aged cheddar, Asiago… and fresh out of the oven artisan bread. I love to make stuffed roasted peppers. Jessica w´s last blog post ..Amazing Peanut Butter Nutella Shake! Jessica+w´s last blog post ..Amazing Peanut Butter Nutella Shake! Goat cheese and fig jam on crackers is always good. Baked Brie with pepper jelly! Chicken wings is my go to appetizer! Hosting a shower on Sunday and having Smoked Sausage in BBQ sauce appetizers. I always make deviled eggs and never have any left, no matter how many I bring. that’s easy! i love a good caprese salad ! :) so yummy, my absolute favorite!! courtney b´s last blog post ..It’s National Coffee Day!!! I too like to make Deviled Eggs (then my brother eats them ALL, always), a cheese plate with some hummus and olives is my usual speed. I must say that your food always looks so beautifully presented and until this day I did not know what manchego even was! I assemble organic grape tomatoes, a mozzarella cheese pearl and an arugula leaf on a festive, decorative toothpick for the occasion. I keep them in the refrigerator, and then lightly drizzle with balsamic vinegar right before the gathering. My go to is asparagus quiche. I love to serve cocktail wieners for my appitizer. My go-to favorite appetizer to serve at a gathering is ham and Swiss sliders. I like cheese and crackers or chicken dip and chips. My husband loves cheese and vegetable trays. Quite often, I will make a special cheeseball rolled in herbs or spices for the center of the cheese tray and a flavorful dip for the center of the vegetable tray. My favorite snack is potato chips and onion dip. My favorite appetizer is my homemade spinach dip! Always a hit!! As a low carber, it is snap peas and hummus, and meat and cheese for us. Johnsonville mild Italian sausage with onions and peppers in rolled filo dough cut into bite size pieces placed on a platter. Dipping sauces of spicy brown mustard and marinara sauce-yum. I PREFER VEGGIE DIPS FOR THEM! I love serving Crabbies! English muffins baked with crabmeat, cheese, butter and spice mixture. My favorite appetizer to serve is a veggie tray. “Home Rolled” Sweet ‘n Sour Meatballs are always a crowd pleaser, often made with a jar of my own Hot Pepper Jelly recipe! My favourite appetizer is little tomatoes with some caramel and sesame on the top 😉 Simple and delicious ! My go-to favorite appetizer is nothing fancy, just an assortment of nibbles, like spiced nuts, homemade crackers with a cheese spread, and pita chips with hummus. Mine would be spinach dip, chips, crackers and cheese. I like to serve mini quiches. My favorite go to appetizers to serve are Buffalo Chicken Wonton Wraps. Thank you so much for the opportunity to enter. I make a rosemary focaccia bread that is so yummy, I don’t usually even top it. My go-to appetizer is my BBQ Meatballs. I throw a few small bags of frozen meatballs in the crockpot, add equal parts BBQ sauce and grape jelly (12 0z or 16 oz work best), stir it all together and set it on low if the party is much later or high if its in a few hours and they are always devoured. my fave fall appetizer is my own rustic bread with melted cheese. I love to make caprese kabobs! My go to favorite app is bacon wrapped shrimp.. you cannot go wrong! My go to appetizer is British Sausage rolls, people love them. We love Baked Brie and figs from our fig tree! 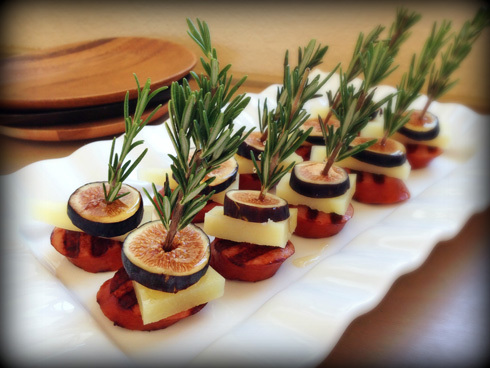 Love using the rosemary skewers and can’t wait to try this! Fresh tomatoes from my garden with melted goat cheese. Lately we’ve been making these appetizers that consist of a date with a piece of good parmesan cheese stuffed inside, and then a pecan half on top. They’re really yummy! I make palm size pizzas! I make pizza all the time, including the dough and I also like making small baby size ones! You can put all kinds of toppings on appetizer size pizzas, and I do! Mini rolls stuffed with tuna salad. I like to make shrimp skewers as an appetizer. I like cheese stuffed croissants. I love to stack an appetizer of sliced smoked sausage, quartered artichoke heart, a bit of roasted red pepper, sundried tomato & a basil leaf. I skewer everything so that the sausage is at the bottom as the base. 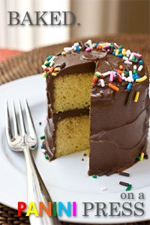 It’s a bit of a mouthful but the best way to eat is to pop the entire stack at once….a big mouthful….but the combination of flavors always gets rave reviews! I love to make a spinach queso dip to serve with tortilla chips! I always get raves over my deviled eggs. My go-to favorite appetizer to serve at a gathering is sausage stuffed mushrooms. bacon wrapped shrimp is my go-to.